"Well-balanced with strength and magic, increasing maximum ground-based combos by 1." Talk to Leon before the second visit to Space Paranoids. The Sleeping Lion is a Keychain for Sora's and Player's Keyblades that appears in Kingdom Hearts II and Kingdom Hearts Union χ. 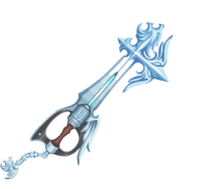 It is also one of the types of Keyblades left at the Keyblade Graveyard. The Sleeping Lion's design varies depending on the upgrade, most of which are seen in Kingdom Hearts Union χ. It bears a resemblance to Squall's Revolver Gunblade from Final Fantasy VIII. The default Sleeping Lion has a dull grey color scheme. Its design invokes Squall's Revolver, with a barrel as the blade's base. Its handle is green, while the guard is a dark grey. The blade is a thin shaft, with a maneless lion head as the tip and a fleur-de-lis as the teeth. The Keychain is a dull grey, with the token being a maneless lion mane. 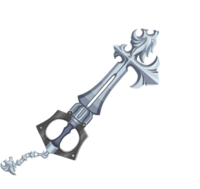 The first upgrade, also seen in Kingdom Hearts II, has a grey hilt, blade, and Keychain. The lion's head on the tip and blade has a more visible mane. The fleur-de-lis has more prominent wings, and the blade has a wider shaft. The Keyblade bears resemblance to both Squall's Revolver and Twin Lance Gunblades from Final Fantasy VIII. In the second upgrade, the handle remains the same, but the guard is now not as symmetrical as previous iterations and now bears a wing similar to the Way to the Dawn's teeth. The blade is longer and more cyan, as is the Keychain, and the fleur-de-lis has more prominent wings. The Keychain token now has a wing emerging from the mane. It is meant to resemble the Lionheart Gunblade from Final Fantasy VIII. 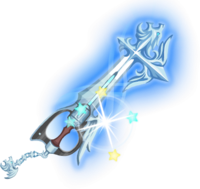 The third upgrade accompanies the Keyblade with an aquamarine aura, trailing wisps of light, a lens flare, and five Lux—three blues and two yellows. 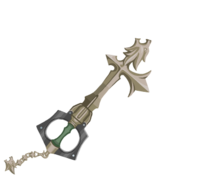 The Keyblade Graveyard variant lacks the lion's head at the tip, and also lacks a Keychain. Sleeping Lion is one of the Keyblades packaged with the Series 1 Play Arts Figures Final Form figure. The Sleeping Lion variation in the Keyblade Graveyard. This page was last edited on 2 April 2019, at 21:34.